TUMC members were instrumental years ago in building Silver Lake Mennonite Camp, a summer camp and retreat centre near Sauble Beach, on the lower part of the beautiful Bruce Peninsula. The camp, on the shores of a small lake, features various styles of accommodation, a large kitchen/dining room/lodge, a rustic sauna by the lake, a crafts building, a large shower house, and activities such as canoeing, hiking and volleyball. 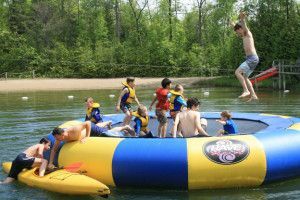 A big sand-bottom swimming pond, with water slides and warm water, is typically the centre of fun during TUMC’s annual June retreat at the camp, along with the Saturday evening campfire, Sunday morning outdoor service with a view of the lake, and Sunday wienie roast. Sauble Beach, with its acres of sand and great Lake Huron swimming, is near enough to walk. Our youth groups sometimes enjoy winter retreats at Silver Lake together with other Mennonite church youth from across Southern Ontario. Specialized men’s and women’s retreats also take place during the winter months. And traditionally, our Grade 5 kids head off to camp together for a week each summer, as a gift from the church family. Many of our kids choose to go back year after year. To learn more, visit: Silver Lake Mennonite Camp.